It’s hot. There’s loud music in the air, carrying over the still waters of the faux lakes of Dubai Media City, and across the buildings. There’s the smell, nay, the aroma of food permeating through everything. Your mouth starts watering because you can smell food. Glorious food. 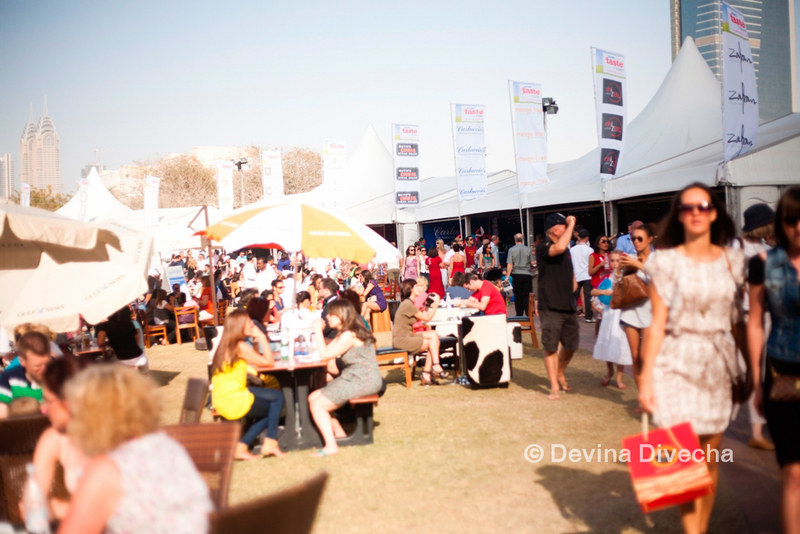 My schedule this year was such I could only attend one day out of the three allocated to Taste of Dubai 2012. But I knew I’d stay dedicated to the cause … of eating. But what did I think of it all? The straciatelle was very good. I’ve never had this type of cheese before, but loved the blend of the sundried tomatoes with the creaminess of the cheese. 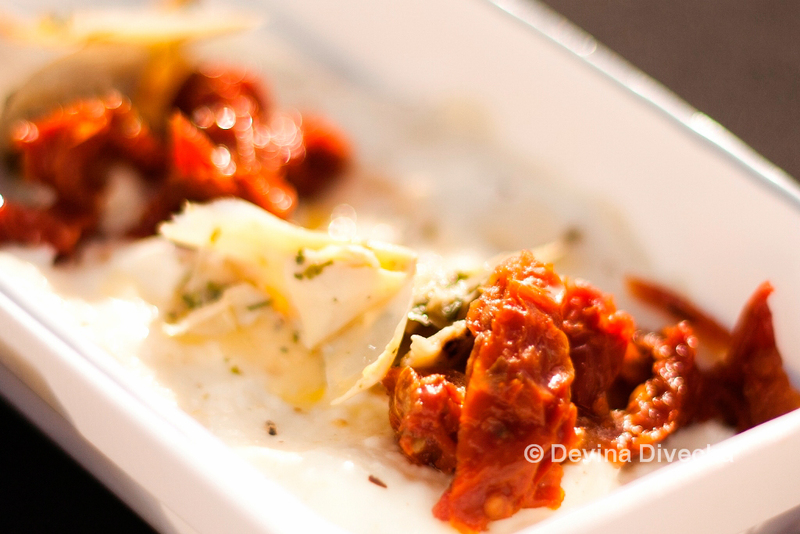 Sundried tomatoes are such a wonderful accompaniment to the best of cheeses, and this was no different. 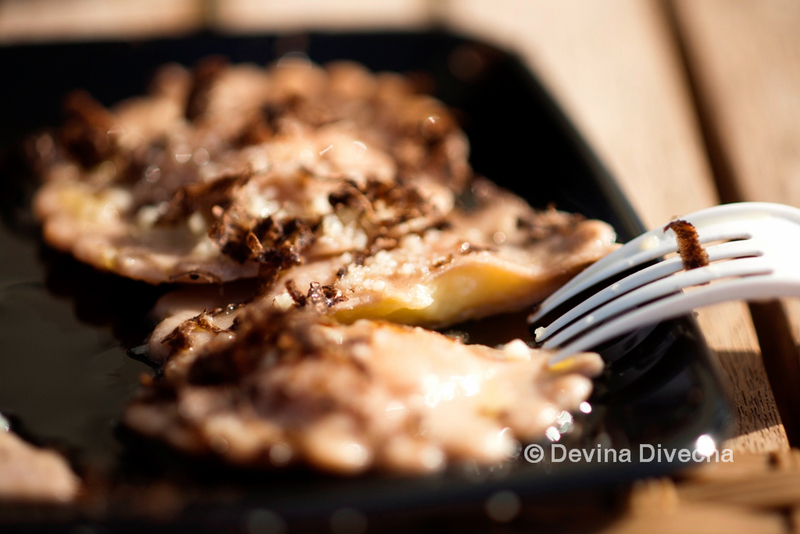 THE WINNER OF THE FOOD TALENT HUNT goes to the truffle ravioli from Ronda Locatelli. What was this brilliant creation, I wondered? I didn’t miss meat here, I just wanted to keep stuffing the truffle oil infused stuffed ravioli in my mouth and never stop. What a gorgeous dish. It makes me want to go to the restaurant just to have this. 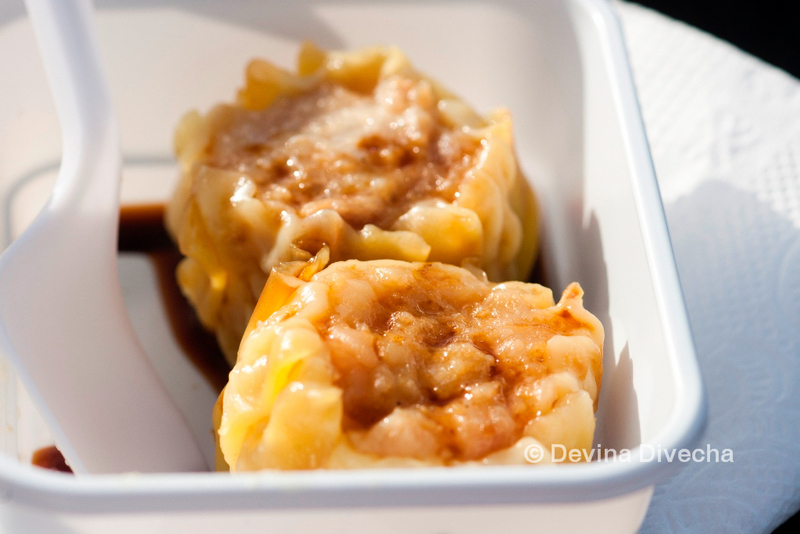 I liked the chicken and prawn Siu Mai from Chi’Zen. With just a light drizzle of soya sauce, I was good to go. Another place I’m happy to try out again. I’ve heard SO much about Table9 from social media and fellow food bloggers, I absolutely had to try something. I love meat, but here again I went for a veg item: the cauliflower pot. I always say, a chef that can make me eat vegetarian food and not miss meat is to be lauded indeed. I enjoyed the pot, which was styled in such a way to look like a mound of earth (it looked like soil on top! ), underneath which was creamy cauliflower (a vegetable I incidentally hate from the depths of my heart). I finished it. It may not be my first choice on a menu but I was intrigued enough to think about trying the restaurant again. The creamy goat’s cheese tower and the dim sum basket were okay. They weren’t my cup of tea, to be honest. I decided to try the alcohol-infused tiramisu and found I liked it very much. The ladyfinger biscuits were at the right stage between solid and mind-numbingly drenched, that added a good texture to the dessert. Ronda Locatelli, I shall return. I already knew their food was good after the Atlantis food safari, but having tried more items, I am definitely impressed. Gaucho! I’d actually been to the restaurant in DIFC as part of my job as a reporter on Commercial Interior Design, and had come away with a story on its interiors. But I’d yet to eat there. All was to change here. The dulche de leche cheesecake was inspired; excellent, excellent stuff. a lovely bottom layer of biscuit, then a layer of dulche de leche and then the cream cheese on top. When paired together, it made for a happy marriage. 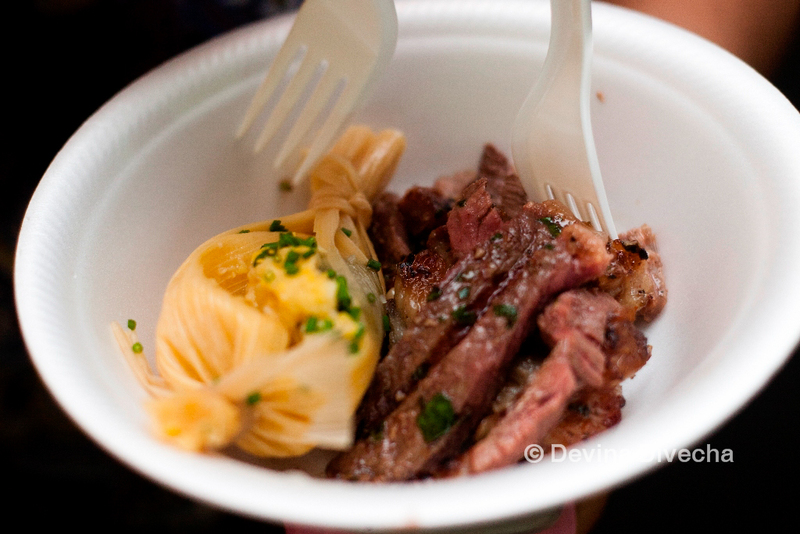 The Churrasco de chorizo was beef strips with corn and while I was definitely impressed, the winner was still Locatelli’s ravioli. 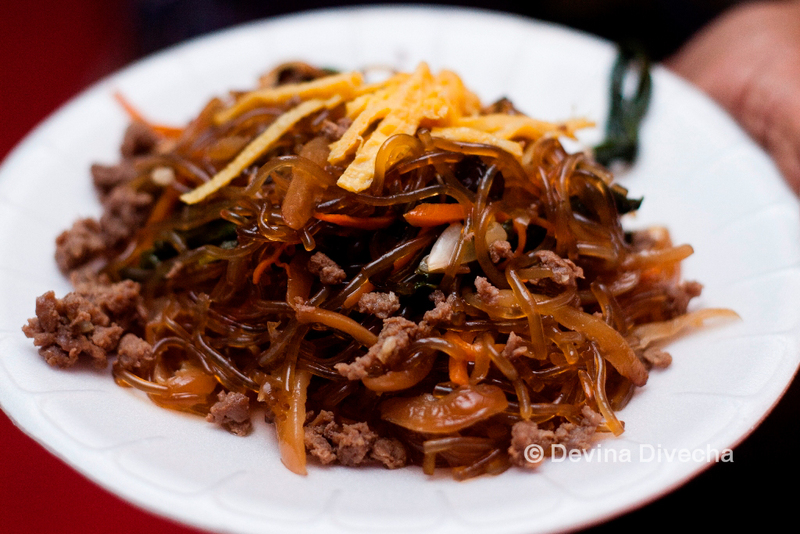 I finished off with Japchae, Korean glass noodles with beef and veggies and actually liked it (thanks to Dina for making me try it with her). Not mind blowing, but decent fare. But what I really, really want to talk about now is two things. First up, the Bloomsbury’s stand. I’ve a long association with this place… it’s owned by a friend, and I’d covered the interiors of the first outlet in Abu Dhabi (and noted with glee that the slogan on its roller ad was from my feature) in my magazine, and was there when it won an award for its interiors. When I walked across the stand that day, I was given great news: the store is planning to open a branch in Dubai soon, at the biggest mall there ever was under the shadow of the tallest building in the world. I, for one, cannot wait. NEXT… we move on to … coffee. Without a doubt, the best coffee joint in the UAE, RAW Coffee has so much to be ecstatic about. I caught up with owner Kim Thompson, and spoke to her about RAW’s plans in addition to getting a crash course in the cold brew coffee. That’s Matt Toogood in the photograph, in his element. He’s UAE’s Barista Champion for 2011/2012 and will soon be off to Vienna to compete in the world championship. This is the second time RAW Coffee has represented UAE in the world event, and I’m hoping they win this time. Good luck Matt! Another bit of great news for them: in about two months, RAW Coffee will move out of its home in Dubai Garden Centre and to its own space in Al Quoz, with more space and more coffee. I, again, cannot be happier. The firm has an excellent track record with its coffee, which is always consistent and like I said, the best coffee you’ll find here. I’m going to be there when the new RAW outlet opens, dragging all my friends with me. As I walked off with the best cappuccino I’ve had in a while, I thought about my Taste of Dubai experience this year and was glad I came. Not only did I discover restaurants I’d normally never venture into, but also found new developments with some of my favourite food brands that make me look forward to the year ahead. For all my pictures from Taste of Dubai (yup, there are plenty more), check out the album on my Facebook page! The ravioli a la Locatelli was one of my fav too. My favourite pics from your set on this post are the ones of the shu mai and glass noodles (even though you didn’t enjoy them much, they look good in the photos.) The cauliflower pot looks scarily like…a pot of planting soil, especially with those baby leaves sticking out on top. Though I do love creamy cauliflower…wish Table 9 had non-alcoholic versions so us teetotalers could have a taste! You know what’s interesting? That cauliflower pot is not on the menu at Table9; you get it as an amuse-bouche at the start of every meal at the restaurant. Would def recommend a visit.The highlight for me was the Gaucho’s Churrasco de chorizo. Loved it! I Live in a Frying Pan – thanks! Did you mean the shu mai from Da Shi Dai or Chi’Zen? I liked the ones from the latter, but did enjoy taking pics from Da Shi Dai…everything looked good. Shame I didn’t like the dimsums from them so much.The cauliflower pot was meant to look like that haha. It was definitely in my head: “Am I going to eat soil? !” Was the cauliflower pot alcohol infused? I did see a sign saying white wine something, but I just thought there was an alcoholic version of the same. @DerrickPereira – Can I not convert you to the cult of the ravioli?? Haha. Yup, Gaucho was good, I agree. Table9 definitely looks interesting and now, having seen a first-hand view of what they can do, I am intrigued. I generally don’t go to high-end restaurants so Taste is a way for me to experience them in mini sizes. But oh yes, I am intrigued. Sally – was lovely to see you too. RAW is just a coffee-drinker’s delight. I am so glad they are in the UAE. When I went away with my cappuccino, I just was so sad when it finished, like I’d lost a friend. It was that good.Thanks! Did try and take as many pics as I could.Arva just said the cauliflower pot had alcohol. I misunderstood the signs I think where it did mention alcohol (white and red wine) alongside the food…and the tiramisu at Locatelli definitely had it, and it was labelled very clearly. Abigail – If you ever go to Ronda Locatelli, do try it out. T’was excellent and so many people thought so!Oooooh I heard about the black cod but I am so picky with fish, I didn’t want to try it. What day did you go? I was looking forward to meeting you! I left work really early on Thursday to get there by 2:30 for the opening, but honestly had one of those “I can’t deal with another dose of Dubai ridiculousness” afternoons where I ended up leaving before Taste of Dubai opened. I walked around inside for while before it opened and it looked busier than ToD from two years ago. I’m glad you had fun!As always, the photos are gorgeous. So wonderfully written.. was amazing meeting u there! Unexpected and BEST! 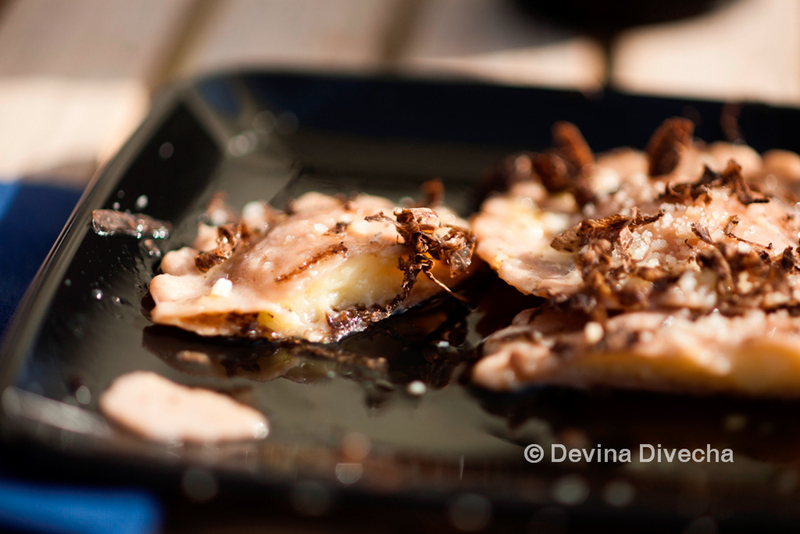 I tried the truffles and the glass noodles thanks to u!! cant wait for next year..want to go with u! AGAIN! Arva, Sally, Devina I can definitely confirm that the cauliflower pot from Table9 does not have any alcohol in it… for sure. Sheryn – I went on Saturday. We seem to be missing each other at events a lot, don’t we? Must rectify soon! I’d gone last year and it was definitely busier than before. Thanks for popping by as always and glad you’re back to blogging!